← A climate change discussion that won’t bore you to death. It always surprises me the short, perfuntory shrift that most newspapers give to labor and employment news, even at a time when the national mind is almost entirely focused on one word: jobs. This piece in the Washington Post typifies what I’m talking about. There’s nothing “wrong” in the piece, but it doesn’t give enough context for a reader to understand what the bottom line actually is. 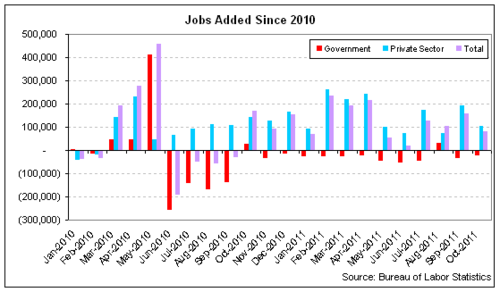 And the bottom line is that the economy didn’t necessarily add the dismal 80,000 jobs the Post and most newspapers have fixated on; the economy added somewhere between 80,000 and 277,000 jobs, depending on which survey you’re looking at, and the number is likely much higher than 80,000, if the trend of recent jobs (under)estimates continues. I’m not saying the jobs situation is rosy; I’m saying it’s more positive than is being conveyed in most daily media, and could be even rosier, if Republicans hadn’t killed a jobs bill that would’ve funded employment in state government. And why am I saying that? Entirely because of this remarkably concise, interesting and well-illustrated post by Daniel Indiviglio over at The Atlantic, which continues to impress me with the depth of expertise it is managing to recruit and wind effortlessly into the Atlantic’s online offerings.